A visual tour - that's something different. This little big book has spectacular photographs that'll dazzle you. 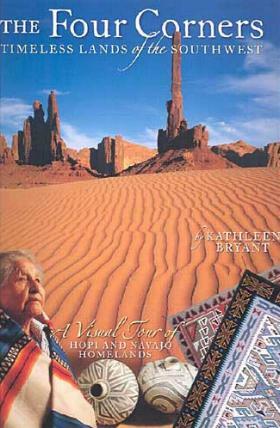 The Four Corners, where Colorado, New Mexico, Arizona, and Utah meet, has some incredible history and is where the Navajo, Hopi, Zuni, and Ute people still live and maintain traditions of long ago. Tourists flock here to see for themselves how customs and tribal law work on reservations. Please observe and respect their cultures and customs. Read about the history of the people in this area while enjoying the buttes and peaks and jaw-dropping beauty of these places. Rugs, jewelry, and pottery were the crafts of the day. Many a movie has been filmed in this area, which initially, helped the Navajo ("Stagecoach" by John Ford) and put this scenery firmly on the movie location map. My favorite photographs are on pages 30/31 and 6/7. Conclusion - A quintessentially beautiful area and so very interesting. I love that there are no "buildings" in sight and I hope it stays that way.